The worst possible thing we can do as moviegoers is expect too much from a film that promises so little, but that’s exactly the case with “Blood: The Last Vampire,” the latest in a string of Japanese Anime releases from Manga Video. It’s not that we want the movie to be a better one; just a longer, more productive one. It offers one of the most well-mounted buildups seen in animation of recent memory, taking us through a fascinating story in which the plot twists are so unforeseen that your eyes sparkle with delight after they are carried out. But in the wake of an astounding battle scene that literally sweeps the breath out of its viewers, the end credits begin to roll, and we’re left wondering, “that’s it? Where’s the rest?” A premise is set up, the characters are introduced, the plot thickens, there’s a magnificent battle of forces, and then... nothing. It’s as if the filmmakers created an open wound and felt that audiences didn’t need to see it heal. The story opens at the onset of the Vietnam war, where the American military, fearing having to join it themselves, have bases set up base in Japan in order to prepare their soldiers and arsenal for possible warfare. Despite their fears, however, even more disturbing events catch their attention, as a series of mysterious but gruesome deaths are reported around the Yokota Air Force base. 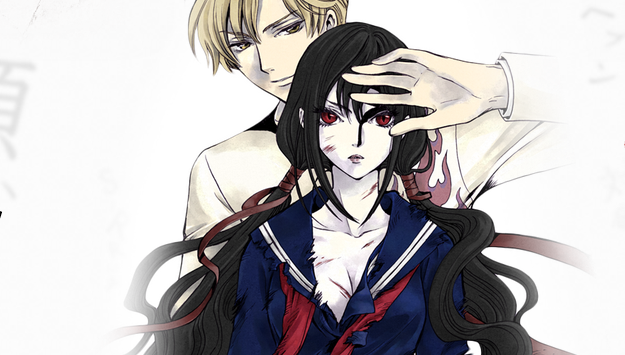 Upon a thorough investigation, an organization housed by the base discovers that vampires—fearless, bloodthirsty creatures that hide themselves in human bodies—are surfacing in Japan, and in order to stop them from creating an even bigger problem than that of Vietnam, they recruit a young woman named Saya, a vampire of sorts herself, to eliminate them. That task may not be so easy for the title character, however: though she is armed with a samurai sword and is an expert in close combat with her enemies, the vampires themselves appear to be setting up shop in a school located directly on base lines. The movie is arranged using a relatively new technique to the genre: the use of digitally-rendered background imagery that is matched up with standard character animation. This method is already popular among mainstream animation studios, but few of them have had the distinction of coming up with something as hard-edged and realistic as this particular endeavor. By opting to utilize computers and standard drawings here, the makers of “Blood: The Last Vampire” have submitted a piece of work that has both refreshing and familiar qualities to it—something not too obvious and yet not too advanced for the viewers to grasp. The backgrounds look astoundingly authentic, while the character animation retains that rugged but daring look that attract so many of us to Anime in the first place. However, it’s hard to say that the story is as equally powerful. While the pace is steady and the events following the premise are effectively orchestrated, the movie seems to be missing necessary background information. For instance, why can the vampires be seen as a threat to the American military? Do they have an ulterior motive? And secondly, why does the military only recruit one person to do a job that should require several people to carry out? Do they know more than they’re saying about where these vampires even came from? Perhaps these questions exist only because I want them to, though—maybe I’m just looking for an excuse to make a rather solid film a little more challenging (and longer) for others. Anime, unlike traditional animation, utilizes the mind so immensely that it practically requires attention to every specific detail. “Blood” isn’t as complex or introspective as the majority of its close relatives, and for newbies to the genre, that’s a big plus (what kind of person, may I ask, would think that any kind of animation could be so deep to begin with?). However, for those of us who are already immersed in the experience, you can’t help but feel a little bit cheated by this straightforward, seemingly abridged, animated endeavor. This is in no way a bad movie—make no mistake about that—but without proficient development past the points that are outlined within this final cut, it leaves a lot to be desired. *Author’s Note: The DVD edition of “Blood: The Last Vampire” advertises the feature as being 83 minutes long, a sever miscalculation from the picture’s actual running time, which is really only 48 minutes.